How do we gain knowledge about our faith? You’d be right if you said that the Bible is the primary source of information to gain knowledge about our faith. This is called ‘special revelation’ by theologians. Special revelation reveals to us the details about who God is, how the universe and all living things came to exist, what our purpose in life is, how we are supposed to behave, what has gone wrong with humanity, what is required to get things right, what happens after we die, etc. But if you stopped there, you’d be missing another important way that God reveals His nature and the truth of His existence to us. “For since the creation of the world, God’s invisible qualities, his eternal power and divine nature have been clearly seen, being understood from what has been made, so that men are without excuse.” Rom 1:20. God tells us that He is the creator of everything. In the passages above, He also tells us that we can see aspects of Himself – His fingerprints so to speak – on everything that He has made. This is called general revelation – the testimony that God’s creation makes about His nature and His existence. Gods’ revelation of Himself through His creation goes far beyond being awed at the peaceful beauty of a forest, or the majesty of waves crashing along the seashore, or the magic of a star-filled night sky. The more science advances, the more evidence we see of the handiwork of an infinitely intelligent creator of the universe, and of the life contained within it. We find detail, complexity, variety and specificity in the operation of the universe and all living things. Put another way, the more science advances, the more difficulties an atheist with a materialistic worldview has in finding adequate explanations for new discoveries. This series that I’ve called Finding the Fingerprints of God is a chance for you to explore some of what God is referring to in the passages in Romans and Psalms above with your kids. 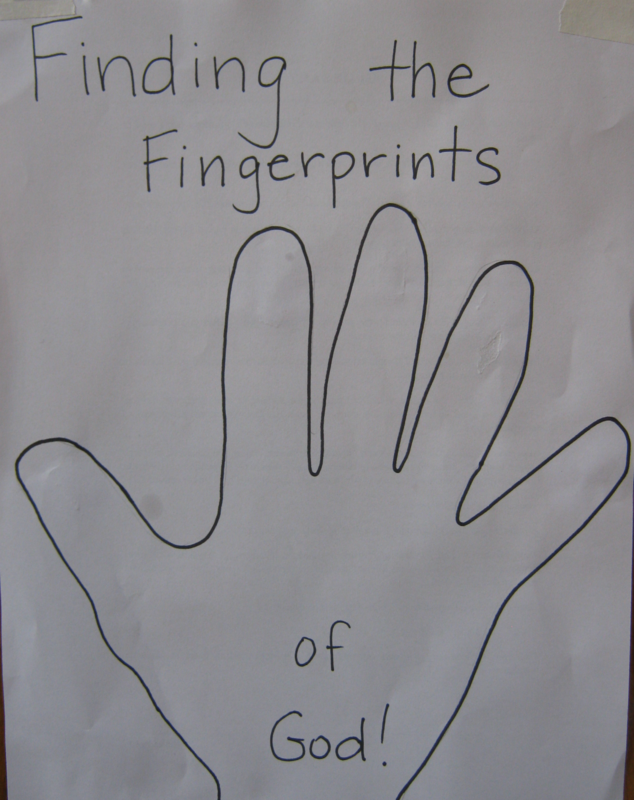 Our kids had a lot of fun discovering clues about God and finding the fingerprints He’d left behind on His creation. I think part of the reason they liked it so much is because it introduced them to ideas that they’d never been exposed to before. Some of the information we’ll cover is kind of mind-boggling. There are complex machines inside your body. The design of the universe is so crazy specific that the tiniest change in its parameters would completely obliterate life. There is code inside your body that is light years more advanced than the most sophisticated computer code developed by highly trained scientists. But I think introducing your kids to the evidence in general revelation that reveals God’s existence and nature is more than just an interesting family activity. Introducing this material will be important – perhaps even vital – to enabling your child to hold on to his faith in a world that is increasingly hostile to Christianity. Your children need to know that science has not proven that God does not exist. We see His fingerprints all over creation. Tomorrow, learn about the fingerprints that astrophysicists have discovered across the universe. Have you introduced your children to some of the scientific evidence for the existence of God? If so, how did you do it? Send me an email!